Pair of very elegant and extraordinary shaped Art Deco armchairs. Fine Macassar veneer (width 7.5cm) in combination with sandy colored nubuckleather fabric by STOLZ/Belgium. The velvet nubuckleather shows a sensual softness with a warm and charming look. A flat anilinhide has been lightly sanded to obtain a discrete write effect. Even at the first contact the customer is surprised by the pleasant touch and the elegant look. (Restauration / re-lacquer and upholstery by 2019). We can send photos of the original condition and fabric swatches by Fedex as well. Unusual pair of French Art Deco armchairs with curved barrel backs and shaped fluted legs with rubbed gilt. The fabric is taupe/grey ultra suede. Seat depth: 19", arm height: 25.25". This exceptional pair of Art Deco armchairs feature a beautiful high gloss black lacquer finish with a plush slate leather upholstery. 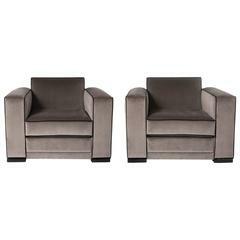 A pair of stain birch Art Deco armchairs, with fluted arms and paw feet, upholstered in buttoned cotton velvet. This superb pair of Art Deco style tulip armchairs feature a tulip form design in a luscious cream leather upholstery, and a high gloss lacquer finish and stair foot base in black.